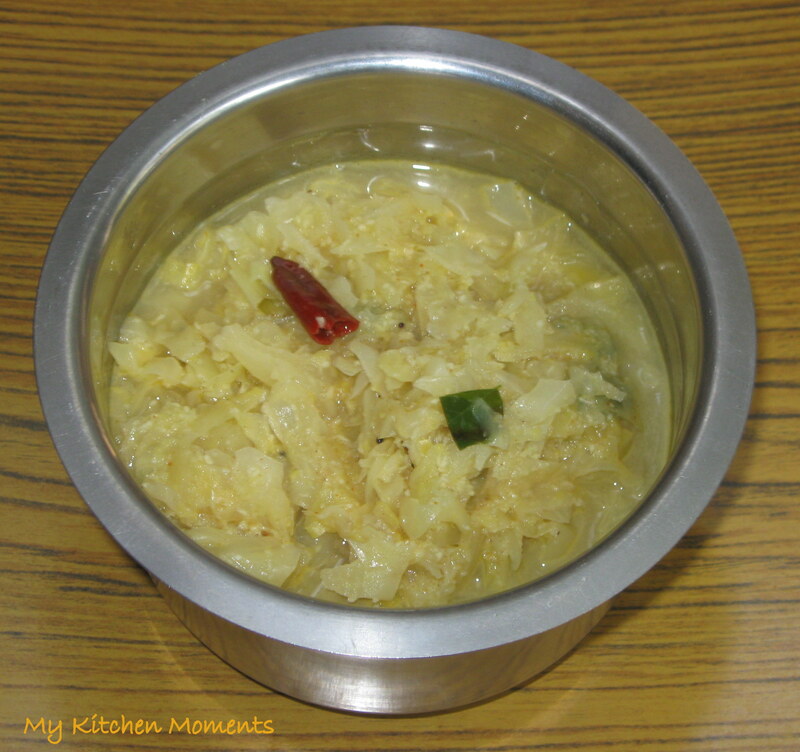 Molagootal is a very popular and staple dish in Palakkad Brahmin homes. Basically, it is prepared with vegetables and lentils, and then simmered with ground coconut. Molagootal is more like a kootu (or it can be said, kootan) but a little runnier. If you are in a mood to finish the cooking without any fuss, then molagootal is an easy option. It is easy to prepare and contains less ingredients, but a very healthy and tasty food. It is mildly spicy, so even the kids enjoy eating. Generally, molagootal is prepared with pumpkin / white gourd (Yelavan), Raw banana (Vazhakkai), Yellow pumpkin (Matthan), Yam (Senai), Cabbage, Spinach (Keerai), Beetroot. Except spinach, molagaootal can be prepared with a single vegetable or a combination of all the above mentioned vegetables. When i was growing up, i remember that molagootal is prepared every week or many times a week at my home. It goes very well with tangy accompaniments like Pachadi – Vendakka thayir pachadi, Pulikaaychal – Inji puli / Inji Pulikaaychal, Brinjal / Kathirikkai puli pachadi, Arachu Kalakki like – Kadu Manga Arachu Kalakkai, Chenai Arachu Kalakki, and / or any kind of pickles like – mango, lemon, nellikkai (gooseberry) Oorgai, Manga Curry (Manga Kari) or else even with Maavadu, Raita – like Onion Raita, Salads etc. Here is the Cabbage Molagootal recipe. Pressure cook the toor dal, mash slightly and keep aside. In a wide vessel, place the chopped cabbage, sprinkle little water, add turmeric powder, salt and allow to cook on a medium flame. Meanwhile, grind the grated coconut with cumin seeds and red chillies into a smooth paste using a little water, and keep aside. Once the cabbage gets cooked, add the ground coconut, mix well and simmer it for few minutes. Then add the cooked and mashed toor dal, little salt, hing, curry leaves and allow it to boil on a medium heat. Adjust the consistency by adding a cup of water, if you feel it is way too thick. Once done, remove from flame. In a seasoning ladle, temper it with the items given under the ‘To Temper’ table and pour over the Molagootal. Mix the Cabbage Molagootal with rice and serve along with accompaniments like Pachadi, Raita, Inji puli and or any kind of pickles. Each combination will be unique and tastes delicious. If you are grinding the red chillies with coconut, then it is optional to temper. Because of using coconut and spices, cabbage does not give that ‘odd’ flavor nor taste. You can even have it with Chapati / roti.